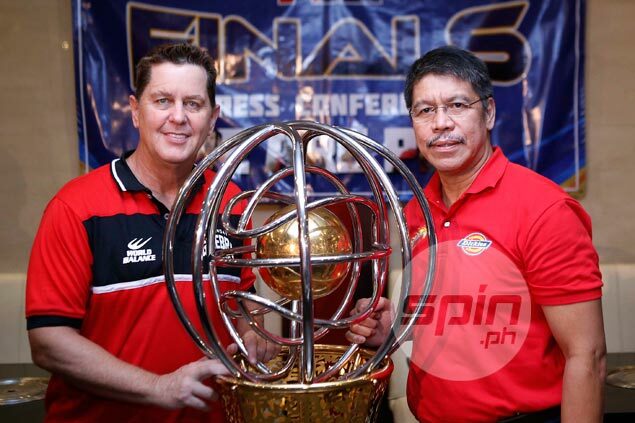 WINNING the most coveted championship in the PBA already merits bonuses most people can only dream of. Doing it three times in a row definitely deserves something extra special – and permanent. The Perpetual Trophy is what’s at stake for San Miguel Beer in the ongoing Philippine Cup Finals against Barangay Ginebra. Also known as the Jun Bernardino Trophy, the enormous trophy stands over three feet, with the ball at the center and the frame made of pure gold, and costs over half a million pesos. The grand prize is passed on from one Philippine Cup champion team to the next, but permanently goes to teams that win three straight all-Filipino titles. And the two-time defending champion Beermen aim to become only the second team to take the trophy home for good since Talk ‘N Text did the hat-trick from 2011 to 2013. Crispa actually captured four straight all-Filipino titles in the early 1980s – but not in consecutive years as the fabled squad won it in 1979, ’80, 83, and ’84, considering only import-loaded tournaments where held in 1981 and ’82. PBA official Willie Marcial recalled that the league used to give trophies to teams every year, until they made it more special. “Nung dati, basta nag-champion ka, binibigay sa’yo yun (trophy). Pero nung simula na tawaging Jun Bernardino trophy, kailangan makatatlong sunod-sunod ka, naging Perpetual na,” the current media bureau chief said in a chat with SPIN.ph. World-renowned Filipino glass sculptor Ramon Orlina designed and created the first Perpetual Trophy in 2006, which was renamed in honor of the late league commissioner Bernardino a year later. After TNT took home the first version, Orlina crafted a second one in 2013. All-Filipino champion teams get to keep it for a year, before giving it up to the new Philippine Cup winner, then a smaller replica is given for good to the previous champion. The Beermen, though, are eager to take the big, authentic version home, and are halfway there.